With the bike finally sorted (mechanically; HDJ carbs et al) and running better than I had ever hoped for, the last thing I was hoping to fix was what I felt was an overly high vibration level in the bars (not excessive, but worse than it should be IMO). So with this in mind, I ordered a custom top triple from Cognito Moto (see pic below; had holes machined out to 50mm to fit my forks, and had them machine the handlebar clamps too). 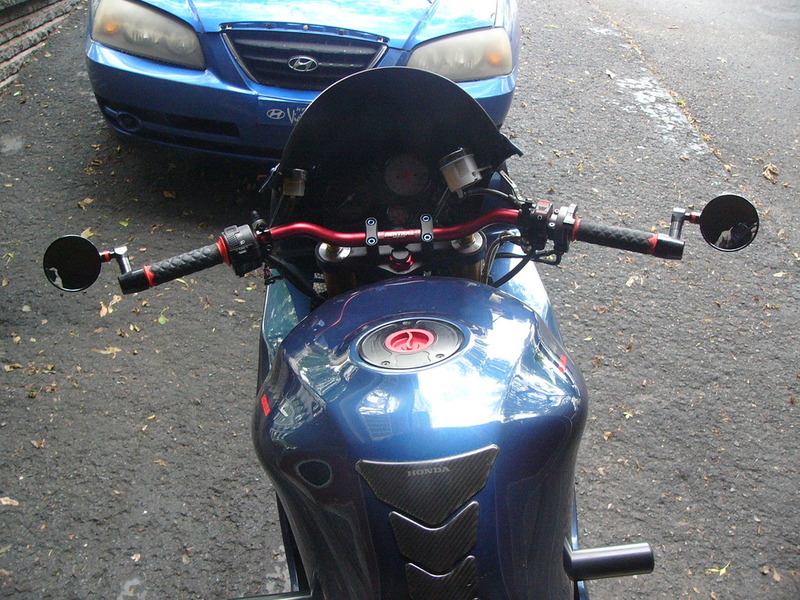 I then ordered an Ultra-Low Rental handlebar (in red, to match some of the red accents found on the bike). I had ordered a Bar Snake (to reduce vibes) only to find the bars have some kind of polymer insert in them (oh well). 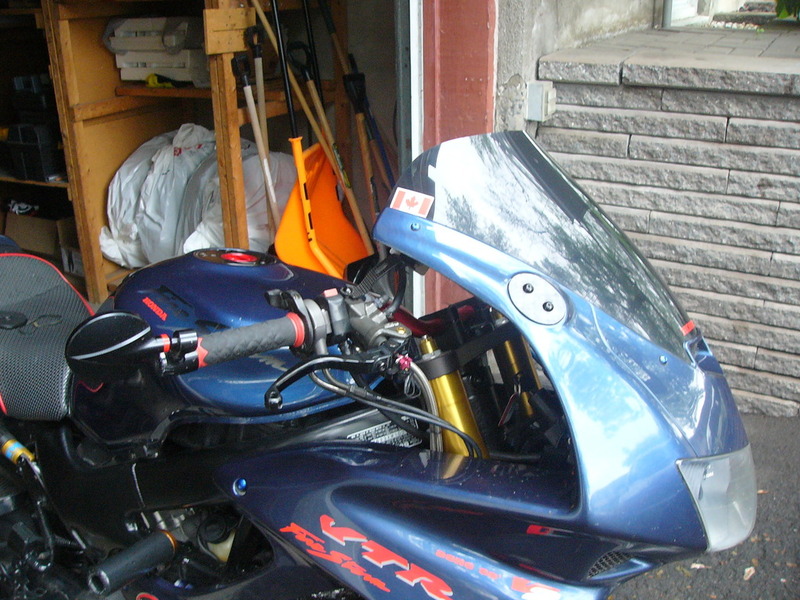 I had to trim the fairing ever-so-slightly, relocate the ignition switch (used lower speedo mount) and all is done. So, the riding position is now slightly more upright and further back. I went for a short ride last evening and was pleasantly surprised by the change. First of all, vibration has been cut by about 70% (mission accomplished). The bike no longer feels semi-frantic at cruising speed (@ 120 km/h) but instead feels as though it's loafing along (until you give the throttle a twist, he he). On the riding position dimension, the Ultra-Lows (which I cut down by 10mm per side, making them the same width as the previous clip-ons) are only about 1.5" back and 1.5" up (at the ends, mostly due to the backward sweep, the pre-sweep portion being almost the same; remember I was running Apex 4" risers previously). It has given the bike an entirely more leisurely feel, which is great for me as it's a for street use anyhow. Hope to get another ride in today (if Mum Nature doesn't open up the skies again). Last edited by mikstr; 07-10-2016 at 09:17 AM. With the new bars would it have been necessary to trim the faring? Looks awesome. I'd love to ride a Hawk with this mod and see how much I like it. Nice clean swap. it really gave me some idea how to do it will order some stuff from 4 wheel online and hopefully have it soon. Thanks for sharing. Last edited by bird-rider; 07-28-2016 at 06:33 PM. Yes he did. But just the little ear lobe.